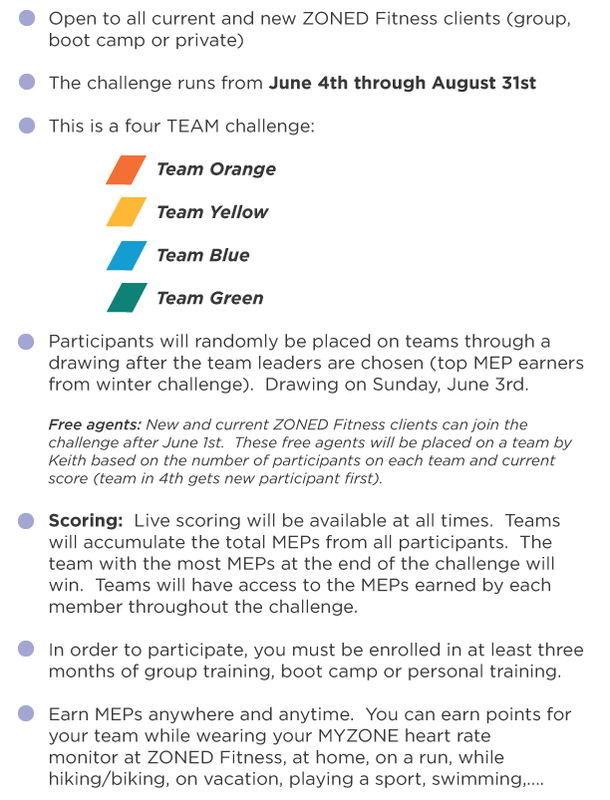 After a successful and fun winter challenge, it's time to stay motivated and focused throughout summer with a unique TEAM challenge. Once again, the challenge is based on MEPs (MYZONE Effort Points) which levels the playing field for all participants. In order to participate in the challenge you must own a MYZONE heart rate monitor ($60) and wear it during all fitness activities over the duration of the challenge. Click here to learn more about the MYZONE heart rate monitor. We all slack in the summer. Some a little, some a lot! The ZONED summer challenge will keep you accountable throughout the summer, even while on vacation. Being on a team means others are depending on you. Your fitness efforts will keep your team going strong. Teams will be encouraged to organized events like hiking or running to add more MEPs to the team total and just have FUN! And of course, we can't forget the Trophy!! Current Clients: Fill out the form below and you're in. New Clients: Select a three month enrollment option below. You will also need to purchase a MYZONE heart rate monitor ($60). Summer Challenge Special for new members only today through June 4th.